For many of us, where we find ourselves on any given day may not resemble where we thought we would be when we started out on our journey. When Jeff Pow purchased Southampton Homestead in 2006, he started with a Bed and Breakfast and a weekend getaway. 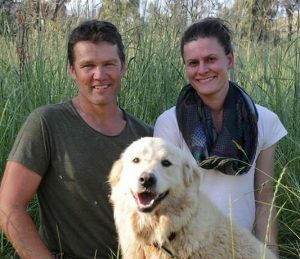 Today he and his wife Michelle run Western Australia’s only vertically integrated pastured poultry business. “The business has grown through boldness, resilience and hope,” says Jeff. After starting full- time farming in 2011, using regenerative farming principles and practices, the Southampton Farm is an amazing multi enterprise farming business based on perennial pastures. All this was recovered from a pine plantation which had been cleared before Jeff bought the property. In 2013 a massive bush fire tore through the Blackwood valley devastating the farm, destroying the historic homestead that was the centre of Southampton. Sheds, fences, water and infrastructure were rebuilt, and the pastures were re-seeded and now Jeff and Michelle’s business continues to grow. But Jeff’s passion extends beyond his life time. He recently began work to build a vision for Southampton that will last 500 years. Regenerative agriculture is about longevity of our food systems, and Jeff is looking at a long time-frame to ensure the efforts that are going into the farm now will continue well into the future. 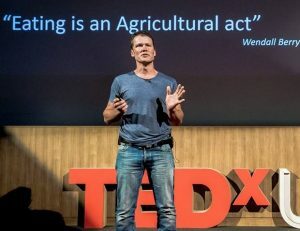 This amazing journey led Jeff to present at TEDx at the University of Western Australia, where he shared his vision for the farm for 500 years. Jeff went on to win the 2016 Australian Government Innovation in Sustainable Farm Practices Award and 2016 National Landcare ‘People’s Choice’ Award at the National Landcare Conference last year. Southern New England Landcare, in conjunction with Southern Blue Regenerative hosted Jeff at a lunch time talk on Tuesday the 15th August at Rafters, Guyra. The event was supported by New England North West Landcare and its member networks Glenrac, Gwymac and Granite Borders Landcare.